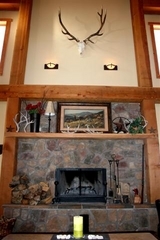 Star View was designed with mountain timber-framed architecture and decorated in a rustic western décor to create a warm and welcoming atmosphere. This custom home features main level living with an open great room, kitchen/dining area that has a floor to ceiling wood burning stone fireplace. The fireplace can be seen while cooking up your favorite dishes in the spacious kitchen, enjoying a meal in the dining area, working from the office loft or simply relaxing on the sofa. Large timber frame beams and beautiful antique distressed wood flooring (reclaimed from an old warehouse in New York State) make this an ideal space for gathering family & friends. Be amazed by the snow-capped mountain scenery that can be viewed in every direction – from both inside and outside the home. Find Pikes Peak framed in the kitchen and upper level loft windows; and, the Sangre De Cristo Mountain Range and expansive canyon views from the great room and other south facing windows. The main level master suite is located off the great room with adjoining bath, walk-in closet and laundry area. This master retreat includes a jetted tub and steam sauna room as well as walk out access to a south facing deck with views of the Sangre De Cristos in the morning and billions of stars at night. For guests, a private wing offers a bedroom w/ private bath, a living area and mini-kitchenette…your family and friends may never want to leave! There is a large fenced area to provide a safe playground for animals and an oversized 2-car garage that includes a separate hobby / shop room. The home is situated on a ridge to maximize the views but there is also plenty of room for horses to roam, hiking and exploring. 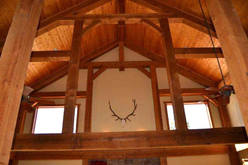 The 35+ acres are gently rolling with a combination of meadows, tall timber and scrub oak. 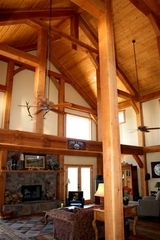 Nearby recreation includes fishing, rafting, equestrian, skiing, hunting and more. Access is along a paved along a paved Nat’l Scenic Byway called the Gold Belt Tour. 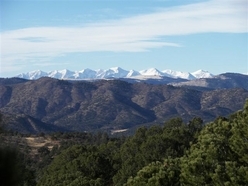 Come and enjoy your private mountain top and relax in the warm sunshine and the majesty of Colorado scenery at Star View!